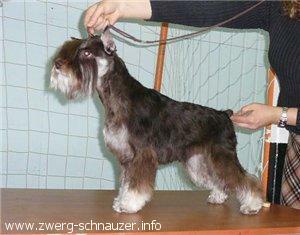 I was looking at some pedigrees at Zwerg-schnauzer breed database and came across very strange pedigrees. Pedigrees with many liver/Tan colored dogs from Russia, like this: http://zwerg-schnauzer.info/dog.php?screen=1&id=12336 and some of these Liver/tan dogs have won and got CAC and are CH in some club shows: http://zwerg-schnauzer.info/dog.php?screen=1&id=9078. I really don’t like this color at all, but I’m wondering if someone is breeding them in FCI clubs and why does this dogs get pedigree and CAC-s in shows?? This color is not allowed in FCI standard. I have of course seen this color from puppymills in the states, but never in FCI countries. I'm glad you asked that question, I have wondered the same thing before! About liver/tan schnauzers, they can't get CAC in National and Intern show, just in specialty. Anyway they are against our beautiful breeds, they are really very ugly . Also, as they are not recognized from FCI, they CAN't judged under FCI judges. They are recognized by Russian Kennel Club and can complete on all russian shows for National Beauty Champion Certificate (CAC), but no CACIB. This color is coming from black&silver dogs of old lines. Such puppies were often born, but color was forbidden and only last years such puppies got some rights. Thats why general quality of the dogs is not hight, but there are few people who are doing correct work and use modern black&silver dogs in breeding and progress is seen. Nice to see some improvement going on there. Are the breeders hoping the get the colour recognition under FCI? jellun wrote: They are recognized by Russian Kennel Club and can complete on all russian shows for National Beauty Champion Certificate (CAC), but no CACIB. sorry for my uncorrectly way about CAC...but when I was to ISPU, in Moscow, somebody told me that. I know that they couldn't be judged under FCI judges...is possible ,in Russia, get CAC from NOT FCI judge? Alessandra wrote: Anyway they are against our beautiful breeds, they are really very ugly . Same could be said about whites not so many years ago, are they ugly now? If there is some people, who ready to make work, and like this color, why not? It is totally own decision to like them or not. And if finally they will get enough dogs of good quality for FCI approvment, why it will be bad? Black and silver also was wrong color first, also whites. And what you would say about black&silver giants and standarts? I love them ))))) and would be happy if also this color will be accepted, but there are not enough people who would be ready to make work for it. It is possible to be judged by FCI judge. But sometimes foreign judges reject judging this color - this happens. Same with ISPU, it is international event and ISPU-CAC couldnt be given: so it was organization trouble to add liver dogs in shedule. Recognizing at FCI will take time, first it should be accepted by PSK and I think its main problem. Even black& silvers were first recognized in Switzerland...PSK is quite conservative. Mybe I have been too "hard" with my words.... , but I remember very well the first b/s and they were not so these liver/tan. Here we have many problems with the pigment that we have not had with the whites when they startered in America...Anyway , you are right...I expressed just a my opinion from my point of view. I don´t know what to say. Everyone is intitled to their own oppinion but perhaps we should try and preserv our breed?! Or if not, why not spotted, red or merle?? It should not be so hard to get with some generations of breeding in cocker or irish terrier. I am not that keen on whites either but I know they are FCI recognized. Funny thing they are not i AKC, for show, and we get lots of whites from over there. I think our breed has enough chalenges for us breeders without looking for new ones. I just try to understand, how this can disturb other breeders and our breed? I love blacks, I breed blacks, someone else love other colors. It do not disturb me. What is SOOOOO negative if there will be one more (or three more, or five more) colors? If they will have enough fans? It is just a question, I really do not understand. First black&silvers where mostly imports from US and that time they were looking already much improved in compare with other colors in Europe. Same I can say with US whites exported/imported nowadays. Most of the dogs from US and Latin America have no problems with pigment and type -because color mixing is allowed. No other white will have such perfect pigment as white coming from colored parents and no other white will look so modern as one who has such parents. We are stuck in Europe without such imports. Spotted dogs and merle is not really possible in schnauzers without other breeds used: this is puppy mill job. But black&silver giants or *red pepper&salt* standarts are possible and this is reality of our breed's genetic. I see nothing bad if someone has will to save such color: its very hard and long work - not many people are able reach Happy End. These weird colors are produced by crossing other breeds with the schnauzers, and in this country, that includes the whites. It has been proven in at least two instances that the whites came from crosses with West Highland White Terriers. Do not assume that what one buys in this country is purebred. Some of these breeders themselves have admitted to falsifying the colors on the AKC paperwork at some point to make it easier to register the dogs; if they can lie about this, what else might they be lying about? http://www.utopiapoodles.com/merle.html I have recently seen some photos of merle schnauzers on the internet. http://www.lisasminiatureschnauzers.com/About_Us.html Please note that they also have dapple and piebald dachshunds. To me, when someone starts experimenting with our breed standards in regard to colors, size, or WHATEVER, it tells me that they really have no respect for what the forefathers of our breeds were trying to achieve.... and only care for the money they might get for coming up with something "different". MsBritmor wrote: These weird colors are produced by crossing other breeds with the schnauzers, and in this country, that includes the whites. It has been proven in at least two instances that the whites came from crosses with West Highland White Terriers. Do not assume that what one buys in this country is purebred. Some of these breeders themselves have admitted to falsifying the colors on the AKC paperwork at some point to make it easier to register the dogs; if they can lie about this, what else might they be lying about? MsBritmor wrote: and only care for the money they might get for coming up with something "different". Is $300 expensive for a mini schnauzer in america? Surely if you are going to cash in on an unusual colour, it would be a lot more then that? Schnauzers in Russia (any colour) is absolutely non commercial breed. And its very strange for me why at once there are questions about commercial benefit, instead of on purposeful work of breeders?. Yes,I'm agree too. Why somebody doesn't try to create " Rotweiller blu merle?" or "Russian Terrier B/S" ???? I believe some people has not any regards for the big,big work that there is behind the "builiding" of one breed. In the future,It'll be always more, more difficult to find the pure colour ( I put in also p/s and b/s). This , of course, just for that people, a like me, who loves the solid colour....and we have worked a lot to get it. We need still work a lot for our breeds, and this is not the right way. I can believe that you make cross-breeds in US. Even in big kennels owners not always can prove pedigrees of their dogs. But color politics and breeding control in Germany (where whites are recognized by PSK) is quite high. Kennels v. Bommerholz & v. Rhedaer Tor & v. Grunewald would never use Westies in their breeding! 1920-1940 Westies were not so popular as now, but white (named *yellow* in PSK studbooks) dogs were appearing even that time. Like with Black Terrier -first we breed to have only 1 color, killing or selling as pets everything else than Black. And some years later we have question why genetic play games and we still have this damn puppies born?! Black & Silver and Merle and much more can come out of dogs who has Giant schnauzer, Rotweiler, Aerdale Terrier and what ever it can be....40-50 years is not much for breed. And who knows which dogs were in the beginning of Zwergschnauzer?! 100 year ago....not long period also! No, $300 is not much at all, particularly for someone who is advertising (pet-quality dogs) over the internet. I'll bet you she is selling her puppies by 5-6 weeks, too. Give her enough time and her prices will probably come up. Prices like that are more in line with newspaper prices here. It could also be, however, that she is doing a high-volume business. I didn't hang around the site long enough to see. The biggest rage here now is hybrids.... crossing two different breeds and giving the offspring some funky name.... and people are BUYING these mutts and paying more money for them than I used to charge for my show-quality dogs. The world is nuts! If we want our breed to remain as it was intended, we have to fight these idiots tooth-and-nail! Educating the masses is one way.